Small Canvas Prints. Design Your Own Set of Small Canvases. 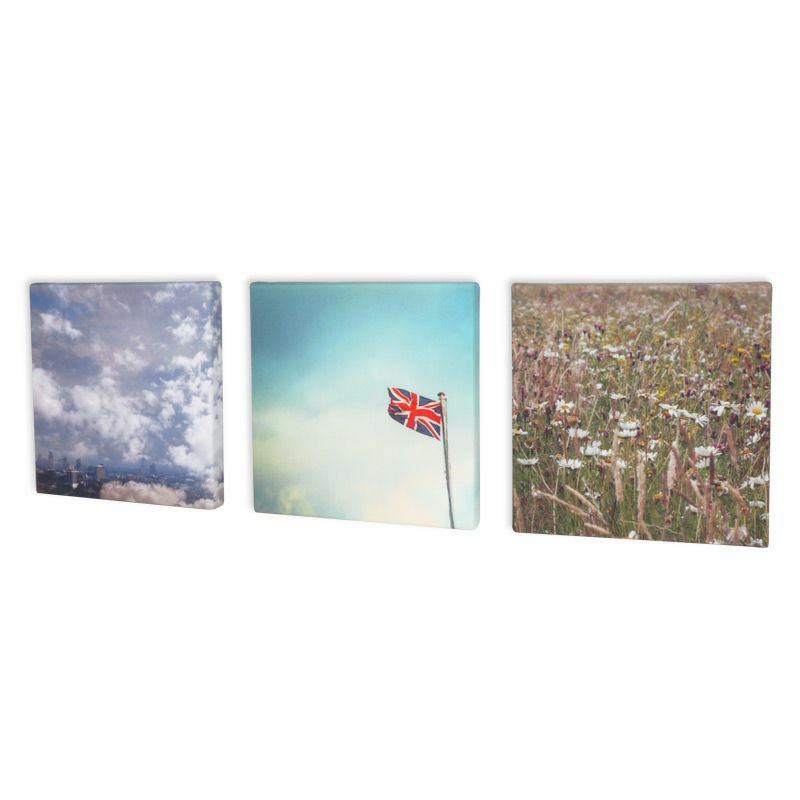 A set of three small canvas prints make a beautiful gift for someone special or are an effective way to add pops of colour or artwork to smaller areas. Use your photos to create unique designs or capture special memories in a chic and modern way. Choose three different images and from a range of size options to create a set of small canvases perfectly suited to you. Liven up smaller areas in your home or office with a set of small canvas prints. The set is comprised of three mini canvases with individual designs on each. Created to the same high quality as our larger canvases, these canvases are printed with environmentally friendly ink and stretched on hand-crafted frames. Each purchase even comes with a lifetime guarantee, so you can enjoy your design for years to come. The miniature wooden frames are made onsite in the UK using sustainable materials, with every print made to order. Your designs are reproduced on genuine woven canvas with slight grain texture and sleek matt finish. Expect a beautifully vibrant print with no undesirable shiny coatings on top. Easily create your own small canvas prints in our online design studio. The tool is simple to use, whilst still giving you complete control over your designs and the final appearance of your small canvas set. Choose from four different size options for your small canvas prints, from 20.5 cm x 20.5 cm up to 25.5 cm x 25.5 cm with a depth of 2.5 cm. These mini canvases are perfect for brightening up smaller areas or for displaying a series of photographs without overcrowding the walls. The depth of your small canvas prints is both sturdy yet lightweight, allowing for a contemporary finish. Your small canvas prints are produced on a woven canvas with a slightly grainy texture, with no imperfections or inconsistencies. The 100% poly fabric is durable and will beautifully preserve your photography or designs. Unlike cotton, it won’t weaken throughout the years. Just like our standard prints, our small canvas prints are created using FSC approved pinewood to keep the products sustainable and at a high quality. The wood is laminated to prevent cracking or warping, giving you a long-lasting set of small canvas prints. Every frame is handmade on-site in our London based factory, allowing for quality checks every step of the way. To get a perfectly tensioned canvas, we use 8 wooden wedges rather than the traditional 4. This means your canvas will stay taught but can also be adjusted over time if necessary. Vibrant reproductions of your designs are made by using a sublimation dying process. Instead of laying ink on top of the small canvases like inkjet printing, this process locks the ink into the fibres of the fabric itself. This results in an incredibly durable print which is scratch-proof, washable and won’t crack. Aesthetically the print has a modern matt finish, with no shiny plastic coating on top. The grainy texture of the canvas completes the look. Solvent-free inks create a rich and sharp print and are completely eco-friendly. We always try and take an environmentally friendly approach wherever possible, to reduce our carbon footprint. To keep the colours strong, hang the small canvases out of direct sunlight. The wrap is what fills the edges of your small canvases. Choose a gallery wrap for a classic look, which extends your image over the edges of the canvas. Alternatively, a mirror wrap reflects your image along the sides. For a simpler look, coloured edges add a pop of colour to your designs. Give your small canvases a contemporary finish with the option to add a gallery wrap, where the image continues over the edges of the canvas. Alternatively, you can opt for a mirror wrap where your design is mirrored along the sides, coloured edges, or no wrap. Choose your wrap preference when you click “Start Design”. Sometimes elements of the image can get lost in the wrap depending on the design, so make sure to read the design tips below for guidance. Your small canvas prints come with a free wall hanging set, to make things easy. Just attach the picture hook to your frame, and hang it anywhere you choose. The kit also comes with screws and wall plugs. To make sure you don’t lose important details of your small canvas prints when there are details by the edge of the canvas – for example, people’s heads - choose an option with coloured edges. Simply place your image on the template and then select the coloured wrap option. Note that the small canvases frame can occasionally be visible through the fabric if there is a large white area on your design. The bleed area is the small amount of leeway we need to make sure the print displays your images to the highest possible standard. The area within the bleed may be visible on the final print, but it is likely to be cut off – so make sure not to put any important parts of the design in that area. Why not tell a story through a three-part photo series? Use your small canvas prints to create a narrative. For example, you could capture three significant moments from a wedding, or show three photos of movement such as your son scoring a goal. It’s an excellent way to use the triple canvas set layout to create a lasting impact. Mini canvases may be small, but they make a big impact when displayed as a set. Try hanging them one above the other in a smaller space such as an alcove, or even along your hallway. It’s a beautiful way to add colour or style to your home, without needing to have large blank wall spaces. Get creative with our montage options, and create a fun photo collage on one (or all!) of your three canvases. You can select a shaped template such as a heart to automatically arrange your photos in a quirky shape, or let your imagination run wild and create your own. If you want to add a personal touch, you can even add a message. If you want a few sets of small canvas prints to decorate your home or give as Christmas gifts, use our 3 for 2 offer and get your third small canvas set completely free. Add your selection to your basket, and the discount will automatically be applied. Every set of small canvases we create is made to last and comes with a lifetime guarantee to ensure you’re always happy with your small canvases.